Brumadoite: Mineral information, data and localities. Name is for the type locality, Brumado, Bahia, Brazil. Crystal structure unknown; presence of tellurate(VI) deduced from microchemical test with the use of KI. Chemically related to frankhawthorneite and xocomecatlite (both anhydrous); also similar to jensenite and tellurate(IV) minerals cesbronite, graemite, millsite, and teineite. microcrystalline aggregates. 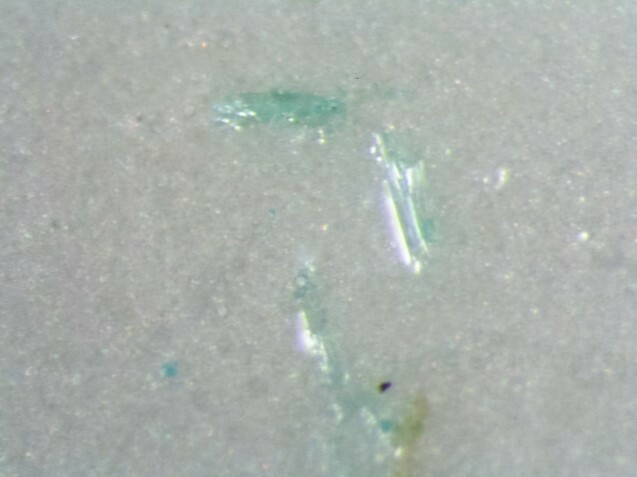 Crystals are play, subhedral, 1 - 2 microns in size. Also pseudomorphoses after magnesite. D. Atencio, A. C. Roberts, P. A. Matioli, J. A. R. Stirling, K. E. Venance, W. Doherty, C. J. Stanley, R. Rowe, G. J. C. Carpenter and J. M. V. Coutinho (2008): Brumadoite, a new copper tellurate hydrate, from Brumado, Bahia, Brazil. Mineralogical Magazine 72, 1201-1205.